Visual hallucination has been described in various diseases and some had localization values . In terminology classification, simple or complex hallucination delineates the differences in perception nature. Visual perception of colored or colorless shapes, lines, flashes or elements were defined as simple visual hallucination. Complex visual hallucination, in contrast, takes the form of people, objects, animals or scenes which the patient may or may not be familiar with. The pathogenesis of complex visual hallucination by irritating the visual association cortex is considered as the “irritative form” whiles the suppression of inhibitory cortical input to visual association areas is considered as the “release phenomenon” [2,3]. For lesions in the occipital lobes, complex visual hallucinations can develop after a latent period of time [1,4,5,6]. The images were typically seen within the hemianopic visual fields, with stereotyped vivid figures that may disappear during eye movements. Commonly, these patients had great insights knowing that the images were not real. In this report, we described a patient with an interhemispheric subdural hematoma in left occipital area who developed complex visual hallucinations in the quadrantanopic visual field. The hallucination appeared only during eye closure. According to electroencephalogram (EEG) recording, the hallucination was not ictal phenomenon. By using serial SPECT images and the focal cerebral perfusion changes, we demonstrated that the parieto-occipital release phenomenon may represent possible mechanism of the hallucination. A 79-year-old man was referred by the ophthalmologist to the neurology clinics for evaluation of blur vision and right leg weakness. He reported falling down one week ago. Upon examination, his visual acuity was 20/20 but with a right inferior quadrantanopia. Extraocular movements were normal and eye ground checkup was unremarkable. The brain magnetic resonance imaging (MRI) revealed increased signal intensity in the left extra-occipital region (Figure 1A; fluid attenuated inversion recovery; Figure 1B: diffusion-weighted images), consistent with subacute subdural hematoma with external compression of the left occipital region. Figure 1: Brain magnetic resonance images (A). FLAIR image revealed hyperintensity lesion in left calcarine subdural area with external compression left occipital area. (B). DWI image revealed no acute ischemic lesion on left occipital area. Tc-99m SPECT performed in three conditions: (C) eye closure, with significantly increased uptake in the region of the left posterior parieto-occipital lobe (arrow); (D) eye opening in the dark- symmetric perfusion in the posterior parieto-occipital lobe; (E) recovery state when hallucinations and hemianopia disappeared, the parieto-occipital areas showed symmetric perfusion. The patient began to develop complex visual hallucinations, seeing colorful scenes in the setting of trees, river winding across, and one aboriginal man in the right inferior quadrantanopic visual field. He was attracted by the man’s colorful dressings although the face was unfamiliar to him. He also noticed that the hallucination only appeared with eye closure and disappeared with eye opening, blinking, or in the dark room with eye opening. Occasionally, the aboriginal man would walk but was confined to the quadrantanopic visual field. He perceived these as non-threatening scenes and realized that they were not real. The cognitive tests are normal. The patient underwent repeated EEGs with a split-screen video. Despite the persistence of these complex visual hallucinations, there were no epileptic discharges or slow waves found either during eyes opening or closure. The hallucinations resolved three weeks later. In order to demonstrate the cerebral blood flow changes in different conditions, we arranged 99mTc-Ethyl cysteinate dimer (Neurolite; Bristol- Myers-Squibb/Dupont Pharmaceuticals Boston, MA) brain single photon emission computed tomography (SPECT)  in three different settings. These included (1) eye closure in the dark room, (2) eye opening in the dark room and (3) eye closure in the dark room after recovery. The first two conditions had intervals of 3 days to avoid the possible confoundings from the contrast medium while the third condition three was performed two months later. Regional activity was normalized to the mean blood flow in the whole brain as 50 ml/100 g/min (normal cerebellar blood flow 52 ± 2 ml/100 g/min). The SPECT images were analyzed both visually and quantitatively. Region of interest (ROI) technique were according to cross-section anatomy described by Pasquier. The counts for each parieto-occipital regions were selected as ROI and referenced to the ipsilateral cerebellar lobe, providing semiquantitative regional cerebral blood flow (CBF) ratios between two hemispheres. The results are shown in Figure 1C to E. The significant increment of CBF found in the left parietal-occipital region was only during eye closure in the state of hallucination. The quantitative measures of CBF ratio revealed a left to right CBF ratio of 1.2 during hallucination. During eye opening in the dark room, the left to right CBF ratio was 1.02. During recovery stage with eye closure, the SPECT showed relatively symmetric perfusion patterns in the ROIs, with a left to right CBF ratio of 1. To our knowledge, this is the first case report delineating complex visual hallucination related to eye closure following extraoccipital compressive lesion. As the CBF increment was not found during eye opening or in the recovery stage (even with eye closure), the neuroimaging findings suggested that the release phenomenon occurred within the visual association cortex during eye closure might play a role in the generation of complex visual hallucination. Complex visual hallucinations could be related to cortical release phenomenon, direct irritative process or both. Typical cases showing irritating process were observed in patients with epilepsy whose epileptiform discharges were observed in the occipital primary visual cortex or visual associative cortex. Based on the normal EEG findings, a direct irritative stimulation was less likely in this case. Complex visual hallucinations following visual pathway disruption would result in release of the endogenous visual memories stored in the visual association cortex. Such a release phenomenon may not provide localization value as they can occur from lesions along the visual pathway, for example, Charles Bonnet syndrome resulted from the retina lesions . The hemianopic hallucinations related to release phenomenon often require time to develop and may vary from 12 hours to one week, depending on the reactionary process . In this case, the hallucination developed one week after the head trauma and the lesion related to the hallucination was located in the extra-cerebral region. The occurrence of visual hallucinations directly on eye closure has rarely been reported, which represent a striking feature in this case. From the literature, one following a minor surgery , one with atropine overdose , one related to epilepsy  and one after coronary artery bypass grafting . For these cases, release phenomenon and derangement of ascending reticular activating system (ARAS) were purposed as possible mechanisms in the generation of hallucination during eye closure. Our patient did not have a history of sleep disorder or heightened dreams, nor was the hallucination presented in drowsy state, at night or during hypnagogic stage. Therefore, derangement of ARAS is not considered here. Previous functional MRI study suggested that eyes-open and eyes-closure had differential effects on brain activity [14,15]. During visual recall on eye closure, there was regional CBF increment in the higher ordered parieto-occipital visual association cortex . Without external stimulation, ocular motor and attentional systems were activated when the eyes were open. On the contrary, the visual, somatosensory, vestibular, and auditory systems were activated when the eyes were closed. From a neuropsychological point-of-view, a normal percept arises from an interaction between afferent signals (bottomup processing) and prior knowledge (topdown processing). Visual hallucination can be generated fully by inner mind or a dysregulation of the external perception and internal image production. As the eye closure represents the “interoceptive” state characterized by imagination and multisensory activity, eye opening may represent an “exteroceptive” state characterized by attention and ocular motor activity. Hallucinations in post-bereavement  and schizophrenia , for example, reflect the goal directed nature of active attentional perception. Hallucinations associated with rostral brainstem lesions, thalamic lesions, delirium, dementia with Lewy bodies  or parkinson’s disease  may have great attentional deficits in which the attention system fails to integrate properly with the top-down processing. As such, the state of eye closure may not only indicate the blockade of the light or other external stimuli interference but also helped to free the internal image production. In conclusion, the release phenomenon from the parieto-occipital cortex was responsible for complex visual hallucinations after eye closure. Our SPECT results showed that eye closure helped to activate the release phenomenon from the associative cortex. The extraoccipital compressive lesion caused reduced visual signal to the visual association cortex, which in turn release the endogenous visual memories and cause the hallucinatory experience. During eye closure, the visual system was activated more easily than the eye opening state, causing the condition-specific phenomenon. The authors wish to thank the patient for the time and commitment to this research. This study was supported in part by research grants NSC99-2314- B-182A-054-MY3 and CMRPG 8B1001 to C.C.C. Bien CG, Benninger FO, Urbach H, et al.Localizing value of epileptic visual auras. Brain 123(2), 244-253 (2000). Cogan DG. Visual hallucinations as release phenomena. Albrecht. Von.Graefes. Arch.Klin. Exp.Ophthalmol 188(2), 139-150 (1973). Manford M, Andermann F. Complex visual hallucinations. Clinical and neurobiological insights. Brain 121(10), 1819-1840 (1998). Vaphiades MS, Celesia GG, Brigell MG. Positive spontaneous visual phenomena limited to the hemianopic field in lesions of central visual pathways. Neurology47(2), 408-417 (1996). Kolmel HW. Complex visual hallucinations in the hemianopic field. J. Neurol.Neurosurg. Psych48(1), 29-38 (1985). 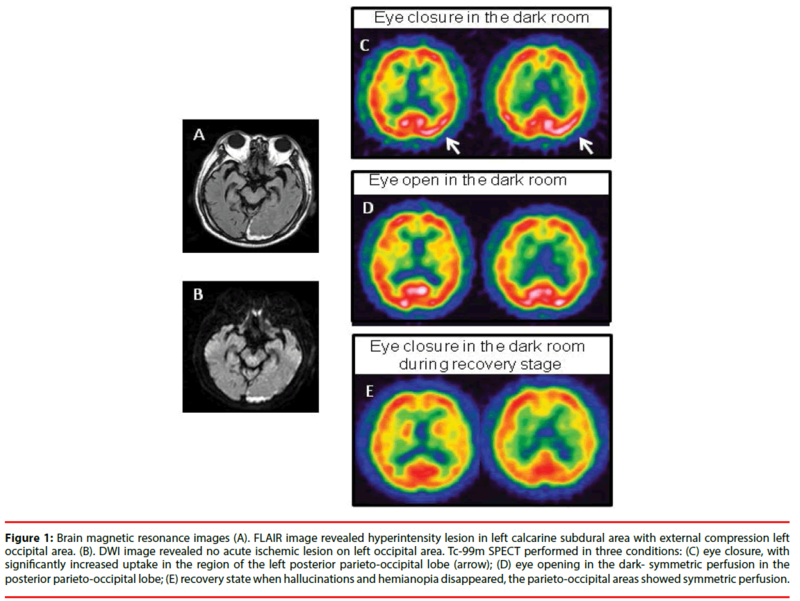 Waragai M, Takaya Y, Hayashi M. Complex visual hallucinations in the hemianopic field following an ischemic lesion of the occipitotemporal base-confirmation of the lesion by MRI and speculations on the pathophysiology. No. To.Shinkei48(4), 371-376 (1996). Chang CC, Liu JS, Chang YY, et al. (99m)Tc-ethyl cysteinate dimer brain SPECT findings in early stage of dementia with Lewy bodies and Parkinson's disease patients: a correlation with neuropsychological tests. Eur. J. Neurol15(1), 61-65 (2008). Teunisse RJ, Cruysberg JR, Hoefnagels WH, et al.Visual hallucinations in psychologically normal people: Charles Bonnet's syndrome. Lancet 347(9004), 794-797 (1996). Lance JW. Simple formed hallucinations confined to the area of a specific visual field defect. Brain 99(4), 719-734 (1976). Fisher CM. Visual hallucinations and racing thoughts on eye closure after minor surgery. Arch Neurol48(10), 1091-1092 (1991). Fisher CM. Visual hallucinations on eye closure associated with atropine toxicity. A neurological analysis and comparison with other visual hallucinations. Can. J. Neurol. Sci18(1), 18-27 (1991). Laloux P, Osseman M. Visual hallucinations on eye closure after cardiovascular surgery. J. Clin. Neuroophthalmol12(4), 242-244 (1992). Eissa A, Baker RA, Knight JL. Closed-eye visual hallucinations after coronary artery bypass grafting. J. Cardiothorac. Vasc. Anesth 19(2), 217-219 (2005). Marx E, Stephan T, Nolte A, et al.Eye closure in darkness animates sensory systems. Neuroimage19(3), 924-934 (2003). Wiesmann M, Kopietz R, Albrecht J, et al.Eye closure in darkness animates olfactory and gustatory cortical areas. Neuroimage 32(1), 293-300 (2006). Roland PE, Gulyas B, Seitz RJ, et al.Functional anatomy of storage, recall, and recognition of a visual pattern in man. Neuroreport 1(1), 53-56 (1990). Schneck JM. Visual hallucinations as grief reaction without the Charles Bonnet syndrome. N. Y. State. J. Med90(4), 216-217 (1990). Aleman A, Bocker KB, Hijman R, et al.Cognitive basis of hallucinations in schizophrenia: role of top-down information processing. Schizophr. Res64(2-3), 175-185 (2003). Mosimann UP, Mather G, Wesnes KA, et al.Visual perception in Parkinson disease dementia and dementia with Lewy bodies. Neurology63(11), 2091-2096 (2004). Nagano-Saito A, Washimi Y, Arahata Y, et al.Visual hallucination in Parkinson's disease with FDG PET. Mov.Disord19(7), 801-806 (2004).